Two weeks ago, I managed to get almost caught up with the laundry. This is no mean feat as I don't like going up and down the basement stairs although it might actually be good for me to do that every day. 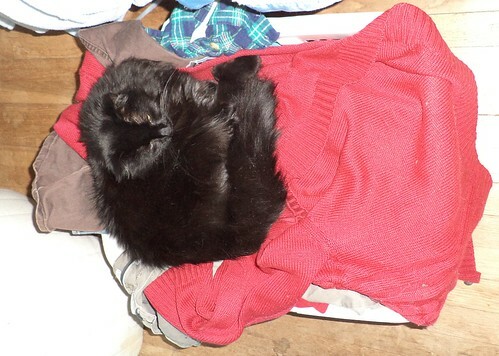 I brought up the clean clothes, which were topped with my red sweater and set the basket on the floor at the foot of the bed. I'd get to folding and putting them away the following day. Yeah, that didn't happen. Claimed. I really couldn't move her. It's just not something that's done. But I wanted the clothes so over the next week, when she was otherwise occupied, I'd remove a few more items from the basket, replace the sweater and put the thing back onto the floor. It took a week but I got all the clothes put away, excepting the sweater. She didn't seem to mind that the only thing in the basket was the sweater. So I had an idea. 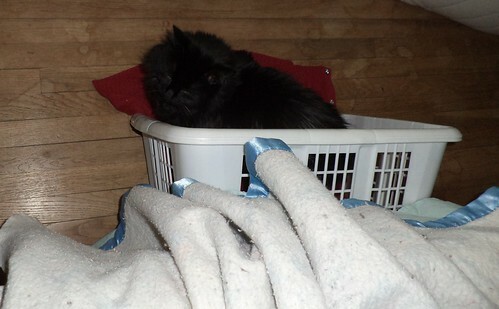 I realize the reasons she hopped into the basket are 1) clean clothes are cat magnets, and 2) the heating vent for the room is about 2 feet from where the basket is. She gets the benefit of a direct warm air current right on her. I don't know of any cat that can resist warm heat. To take advantage of this, I made some adjustments to the above layout. I turned the basket on its side. This is where she goes during the day and at night, too. I've resigned myself to having just one clothes basket through the rest of the winter. I probably could get another one as they aren't that expensive and, when there's heavy rains forecast, being able to pick up any bedding I have in piles on the basement floor off the floor, will give me peace of mind in the event of seepage. But, I think this fascination will wear off once we get through these polar vortexes and spring has arrived. There are far worse places she could want to sleep.